This is a short video showing how easy this tent is to set up and take down. It also shows some of the key features including the awning, floor, funnels, and accessories. 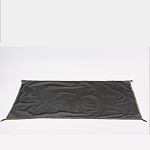 This tent is similar to a Springbar tent with some key features being superior such as a floor that is twice as thick, a stronger no-see-um mesh for windows, metal stakes vs. plastic, and stronger roof capacity.